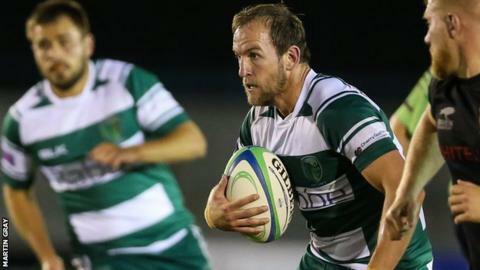 Guernsey Raiders veteran Malcolm Barnes says he is "glad to assist" fellow scrum-half Adam Nixon, who joined the Channel Islanders in the summer. Barnes is fit again after rib and hamstring injuries, and will be on the bench as they host winless Westcliff in National Three London and South East. Nixon, 21, has occupied the number nine shirt in his absence. "We haven't had a lot of time together so far, but we're going to work a lot in the next few weeks," Barnes said. "Adam's playing very well and I'm glad to assist him as much as I can. "He's very fresh, talented and got the attitude. Now that I'm back fit we can do some extra skills before and after training," he told BBC Radio Guernsey. Barnes almost retired last year after being dogged by injuries, having twice dislocated and once broken his neck. "In the game of rugby if you come on and take it easy that's probably when you're going to do more damage," added Barnes. "This week we've put a big focus on our defence, so hopefully that'll be the difference."